Church elders George Anthony, Adam Murray, Douglas Milne and Brian Webster. Picture by Jason Hedges. 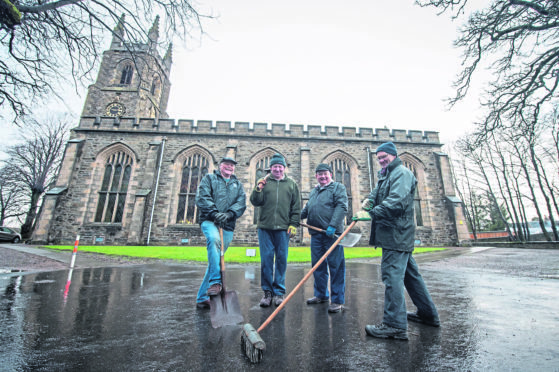 A week of events is already being planned for the Kirk of Keith’s 200th anniversary in March. However, now the preparations have been given a boost after it was announced that the young members of the congregation have been recognised for the work they have done in the community. The group has been nominated for a faith-based honour in the National Youth Work Awards, which will be held in Glasgow in March the same week as the anniversary events. The youngsters have helped organise social activities for the church as well as give presentations about topical issues, including transgender awareness. Congregation member Esther Green, who has two daughters in the youth group, said: “The group has a tremendous impact in our church and community. The former parish church of Keith was near the River Isla and dated back to medieval times. It was rebuild in 1569 before it was abandoned in 1819 when the new church, which is now known as the Kirk of Keith after the congregations of St Rufus, Botriphnie and Grange united, was built. A large banner designed by church members is currently being prepared for the bicentennial celebrations to be displayed during the week of activities, which include a recital concert, thanksgiving service and exhibition of old photographs and memorabilia. The congregation has been without a minister since 2015 but continues to work to find a replacement. Interim moderator, the Rev Sonia Palmer, said: “Even at this time of a vacancy, members have come together to plan an ambitious week of activities to mark this important milestone, involving all different age groups.